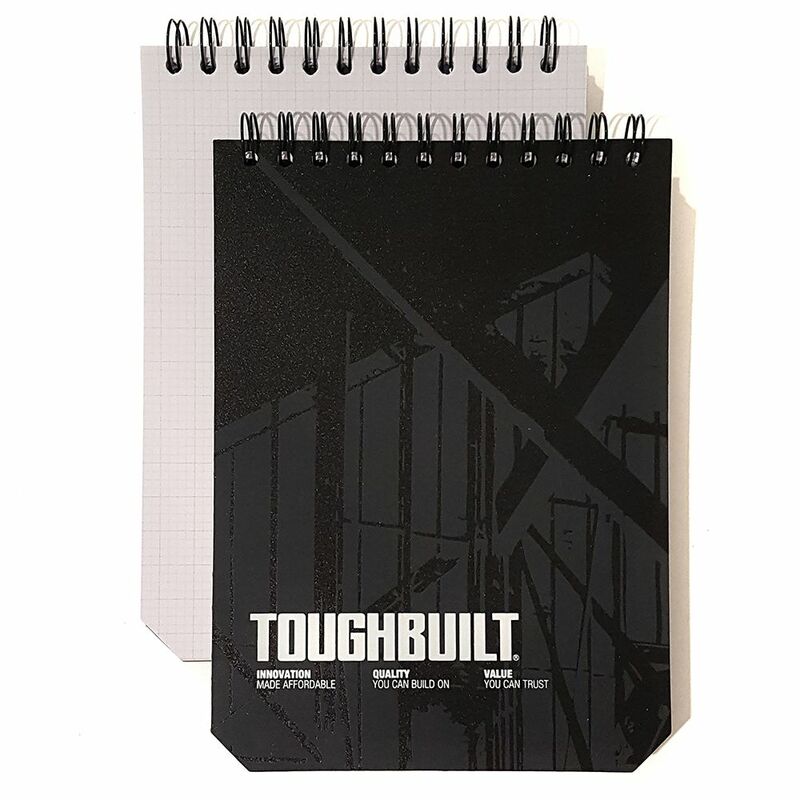 ToughBuilt Grid Notebooks are heavy-duty pads designed and built for the jobsite. Plastic covers and heavy-gauge steel binding coils endure the rough conditions, and thick cardboard backing keeps the pad rigid when writing while standing up on site. The grid pages are perfect for taking notes or sketching plans. For maximum jobsite organization, combine the Large Grid Notebooks with the ToughBuilt iPad Organizer (TB-56-IP-C), or Large Organizer (TB-56-L-C). This 10-Drawer tool chest and cabinet is made from high grade all welded steel construction and finished with tough textured black industrial powder coat paint. All drawers feature 100 lb. rated ball bearing drawer slides featuring Secure Latch retention system. All drawers have extra-large full width aluminum drawer pulls for easy access. Heavy Duty 5 in. x 2 in. casters rolls easily under heavy loads. Two swivel casters have brakes to keep the cabinet in place. An ergonomic tubular side handle is designed to comfortably fit your hands for easy pushing of cabinet. The drawers are secured by a keyed internal locking system and come with 2 keys. Drawer Liners are included. This black 6-Drawer tool cabinet is easy to roll and lets you take your tools and supplies right to the job. Rugged all welded steel construction is protected by a tough industrial powder coat paint finish. All drawers feature 50 lb. rated ball bearing drawer slides. Deep bottom drawer features two sets of slides that allow you store large heavy tools. All drawers have extra-large full width aluminum drawer pulls for easy access. Heavy Duty 5 in. x 2 in. casters rolls easily under heavy loads. Two swivel casters have brakes to keep the cabinet in place. All casters are easily mountable. Simply turn the cabinet on its top and insert bolts through the caster plate into pre-welded nuts and then just tighten down. Each mobile cabinet is further supported with a reinforced base which offers added strength for heavier loads. An ergonomic tubular side handle is designed to comfortably fit your hands for easy pushing of cabinet. The cabinet drawers are secured by a keyed internal locking system and come with 2 keys. Large Grid Notebooks 2-pack ToughBuilt Grid Notebooks are heavy-duty pads designed and built for the jobsite. Plastic covers and heavy-gauge steel binding coils endure the rough conditions, and thick cardboard backing keeps the pad rigid when writing while standing up on site. The grid pages are perfect for taking notes or sketching plans. For maximum jobsite organization, combine the Large Grid Notebooks with the ToughBuilt iPad Organizer (TB-56-IP-C), or Large Organizer (TB-56-L-C). Large Grid Notebooks 2-pack is rated 5.0 out of 5 by 9.